"Healing Mind, Body & Spirit Through Yoga"
Yoga Camp 2018 will hold space for our campers to heal their bodies, free their minds, and awaken their joyful spirits. 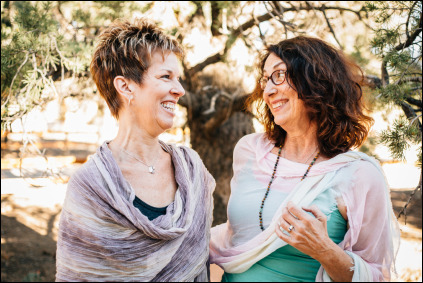 Once again, Lisa and Kathy have recruited teachers who are skilled and passionate about creating healing moments through the practice of yoga and movement. Whether participating in a physical yoga or movement class, making therapeutic art, listening or singing along to devotional music, enjoying the healing spirit of the pines, or contemplating the wisdom philosophies our teachers offer, your body, mind and spirit will be awakened to its own healing abilities. "Campers" stay "under the pines" in a variety of cabins with numerous rooms and shared bathrooms inside. Meals, workshops, yoga classes and other events are held in the main lodge or other meeting areas. Wonderful meals are served cafeteria style in the Lodge beginning with dinner on Friday evening, and ending with lunch on Sunday. Price includes food, lodging, classes and activities (additional fees for massage, acupuncture, and/or individual instruction). Upgrades: $30 pp for Craig’s Cabin and Cabin 6. Thursday arrival $20 per person (Lodging only, bring picnic food. First meal is dinner on Friday). Non-refundable registration fee: $75 . Camp Website - Sign Up!